Hey there, Sin City Stamps fans! Barbara here with some more fun ways to use your Sin City Stamps. Another month has passed and it is already September. Hope everyone had a wonderful, fun, and safe Labor Day holiday. 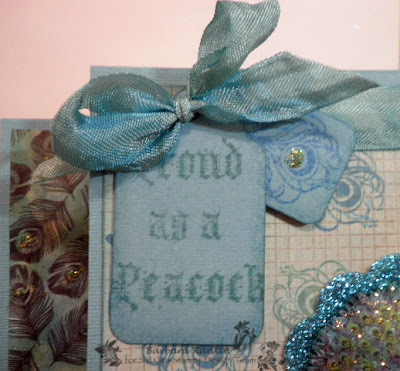 I want to share a center step card with you today, and show you how to make your cards sparkle. I have shown these on my blog before, but if you missed it, I linked to a template I found online, so proper credit can be given to that person. What I love about these cards is that they can stand alone, like a framed piece of artwork, and displayed proudly by their recipient. Trim aqua CS to 5-1/2" x 8-1/2". Follow Center Step Card Template to make your score and cut lines. Your scored card should look like this from the front. 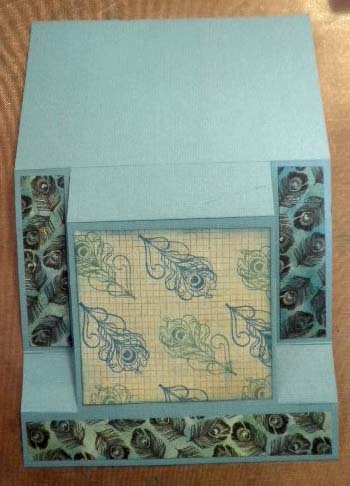 A view of the card from the side. Stamp peacock image from Wildlife Plate twice onto eggshell CS with Tuxedo Black ink. Color images with Copic markers. 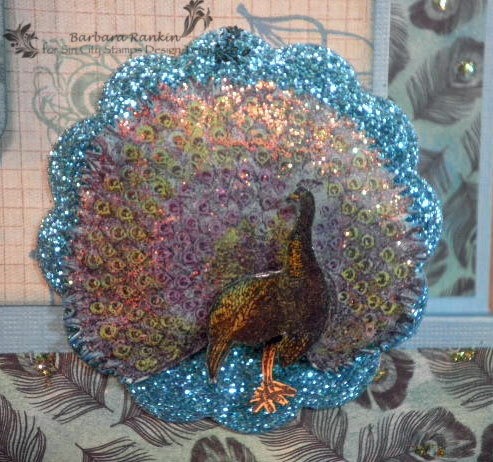 Fussy cut full peacock image and just the body of the second image. 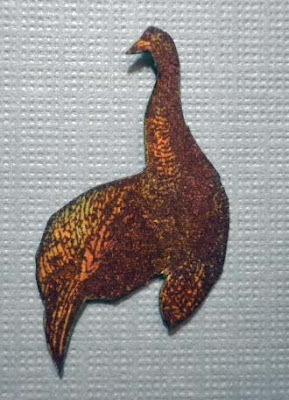 Gently shape both pieces and adhere peackock body over full peacock image. Add Diamond Stickles to the tail feathers and a light coat of 3D crystal lacquer to the body to give it some shine. 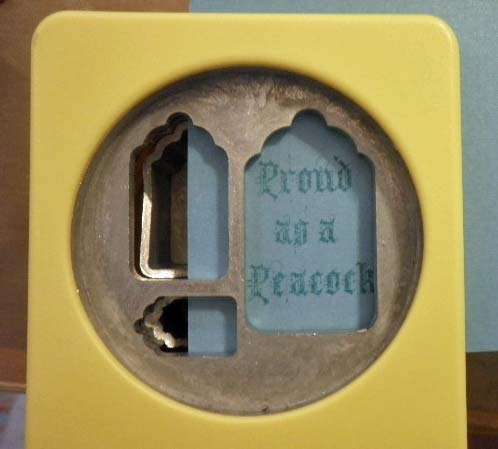 Die cut aqua glitter cs with 4th size scallop circle die. Use pop dots to adhere peacock to scallop circle. 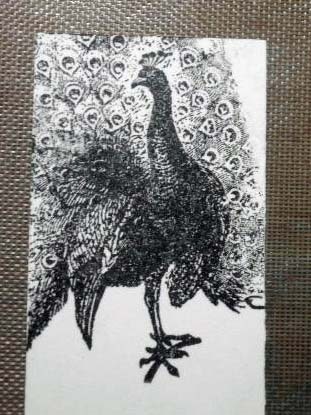 Trim a 3/4" strip from peacock feathers black/cream paper. Color strip with salty ocean and evergreen bough distress ink colors. 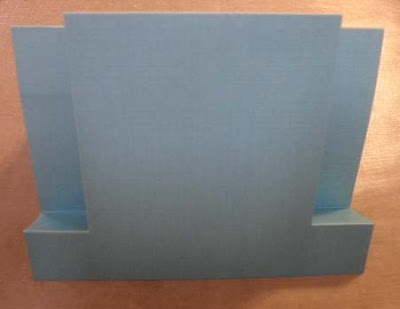 Cut strip into three pieces: 2 pieces at 3" x 3/4", 1 piece at 5-1/4" x 3/4". 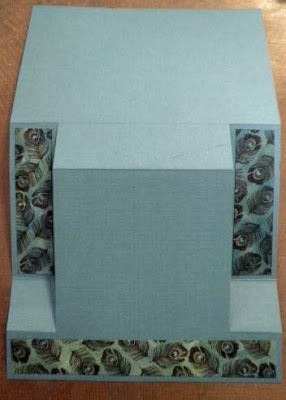 Adhere to card front, as shown. Stamp peacock feather onto graph printed paper with salty ocean and evergreen bough distress inks, as shown. 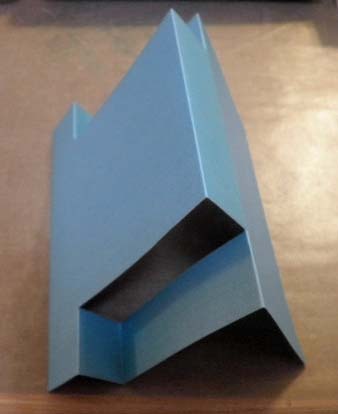 Trim to 3" x 3-1/4". Adhere to card, as shown. Stamp Proud as a Peacock with evergreen bough and single feather with salty ocean onto a scrap of aqua CS. 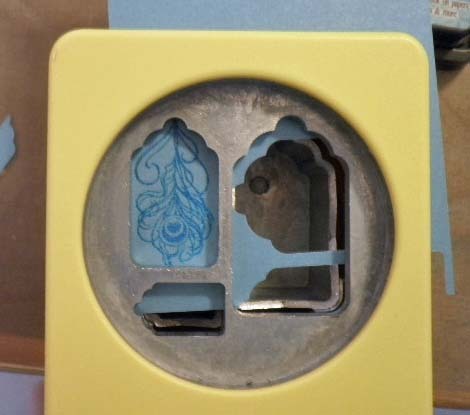 Cut each image out with tag shape punch. Edge each tag with the distress inks. 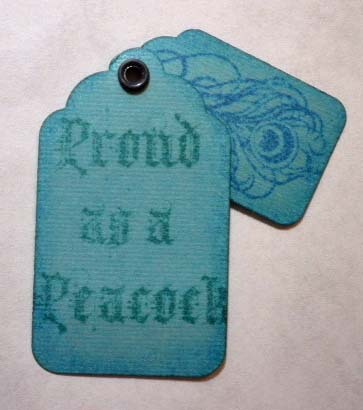 Punch a hole in the top of both tags and attach together with a single eyelet, offsetting the smaller feather-stamped tag. 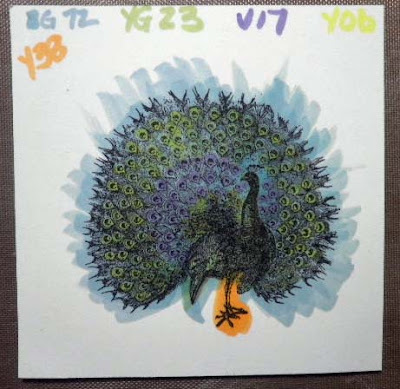 Add Lime Green Stickles to each "eye" of the peacock feathers on both the printed paper and the tag. Color a piece of eggshell seam binding with both distress ink colors and spritz with water. 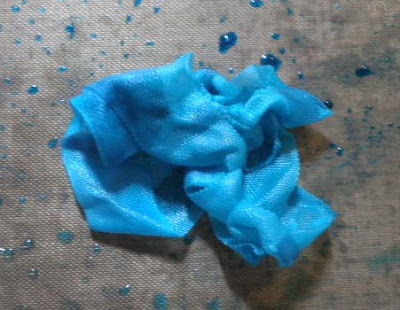 You can use your heat gun to speed up drying time. Run seam binding through the tag eyelet, around the card front, and back through the eyelet, bringing both ends to the front. Tie is a pretty bow. Adhere aqua glitter scallop circle with peacock image to card front, as shown in photo of finished card above. Voila! You now have the sparkliest peacock and feathers around. I wish the camera could pick up the sparkle, but trust me, it is beautiful in person. 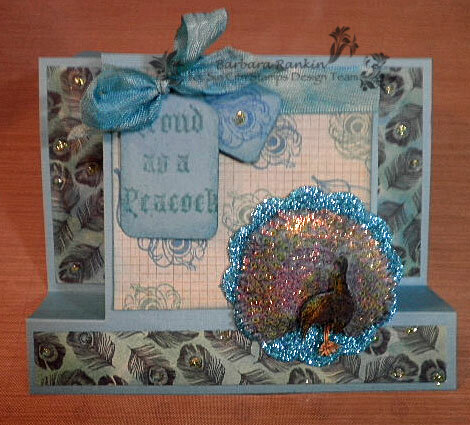 I hope you enjoyed my card project today and that I have inspired you to make something sparkly with Sin City Stamps. 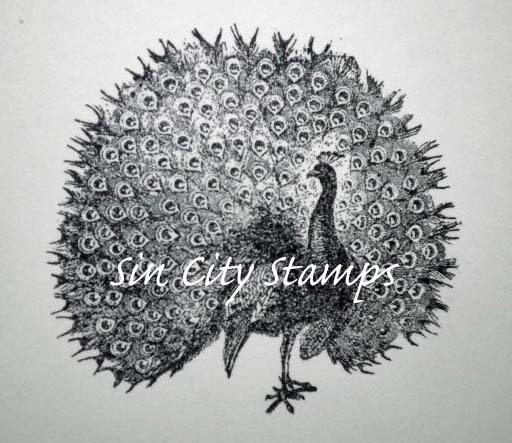 Check out the newest releases on the Sin City Stamps store, and keep checking back on the SCS Blog to see what the rest of the DT is creating. Also, I would love for you to visit my blog at Black Hole Art Studio for more of my projects. 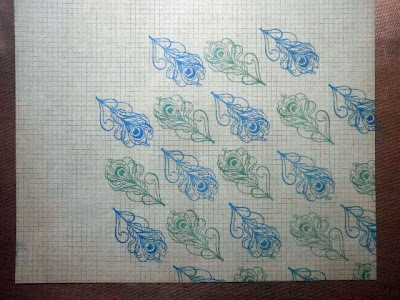 Thanks so much for stopping by, and have a wonderful weekend, and make some time for stamping! What a fun card!! Lovely tutorial too!! You color so pretty! Fabulous card and step by step!! 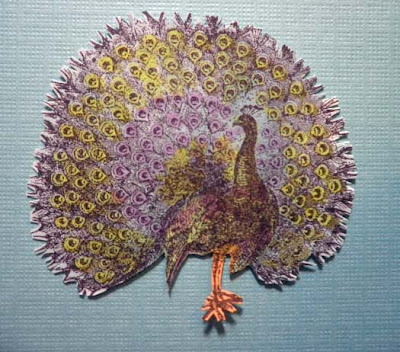 That peacock is to die for!